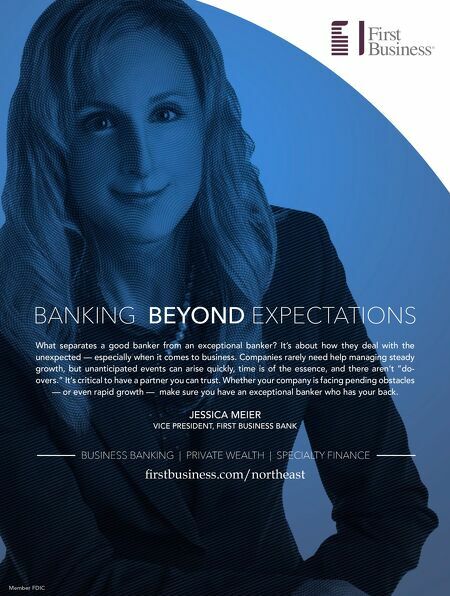 56 | I NSIGH T • A p r i l 2 0 19 w w w . i n s i g h t o n b u s i n e s s . c o m Member FDIC BANKING BEYOND EXPECTATIONS BUSINESS BANKING | PRIVATE WEALTH | SPECIALTY FINANCE firstbusiness.com/northeast JESSICA MEIER VICE PRESIDENT, FIRST BUSINESS BANK What separates a good banker from an exceptional banker? It's about how they deal with the unexpected — especially when it comes to business. Companies rarely need help managing steady growth, but unanticipated events can arise quickly, time is of the essence, and there aren't "do- overs." It's critical to have a partner you can trust. Whether your company is facing pending obstacles — or even rapid growth — make sure you have an exceptional banker who has your back.